Just to warn that while this post doesn't contain any profanities nor anything explicit it does however mention what are considered adult concepts. While I think there are a great many of good writers I think there are a lot of stories that end up unenjoyable or even awful. There are a great many reasons for this. Everything from personal preference to good writing with poor execution. An individual reader's personal preference generally isn't something a writer can actually do anything about while poor execution is. I say generally because too often were a writer of a series will go wrong is in the execution which as I said is something that can be controlled. The red line is to show that a book might cover not only a key point but be a transition between two. In this instance the transition between the climax and the start of the resolution. The difference is subtle but important because the climax doesn't have to be the exact "middle" of a story. It will be in there generally between a Build up that isn't stretched out too long and a Resolution that isn't rushed. The problem I see most in a series is that while they can get down each stories BCR they fail in the series. They can't see the series for the books. They then wonder why they've lost readers around book 3 or why people are upset about the series end. This gets worse the longer the series is. Too often they end up repeating elements so much that nothing it really left for the resolution of the story. The climax is about the hero/heroine continually almost getting(or getting) raped, maimed, death of best friend number three, or their relationship is over....again. The elements are repeated at nauseam to the extent the plot is a run on sentence. TheHero/HeroineRisesToGreatPowerFallsFortheHeroine/HeroTheHero/HeroineGetstheirLimbsChoppedOffWhileTheHeroine/HeroIsRapedInFrontOfThemThenTheyWinTheEnd. Too often instead of the above of BCR we instead end up with the above run on sentence with a series story that just suddenly ends. If you stop and look at it there is no wonder why people are left the way they are. A reader looks up after some point and wonders where that great beginning went. Some times they are even apathetic to the end of the villain because it was anticlimactic. They are then left wondering why the end feels so poor while they enjoyed the series(assuming they finished it). Another reason is that if in book 1/2 they are ending a relationship or killing the ultimate villain then in book 4/5 they really shouldn't be doing the same things again. Goodking and the Sword of Truth series is a good example of the repetitive. The first book is a great build up and then after that each book is pretty much the same. Some where around the 6th(may have been 7th) book when the Heroine was almost getting raped for the 7th or 8th time after them going through hell and back again, I kind of gave up. I finished that book and then never picked up another one. By this time, for the most part, I knew exactly how the story would end. There are exceptions where the author wakes up to the fact. The Frost and the Night Huntress series#I'm speaking of the series and not the spin offs). I was about done after book 3. For a UF series it was annoying that at start of each greater conflict was their relationship conflict. The meat of the story always dealt with a much bigger conflict which, thankfully, made the relationship conflict redundant. Especially so because it happened at the beginning of each book. I'm not sure if it was the plan from the start or that she did wake up to the fact that you can't carry the over all series story with "and they broke up again". 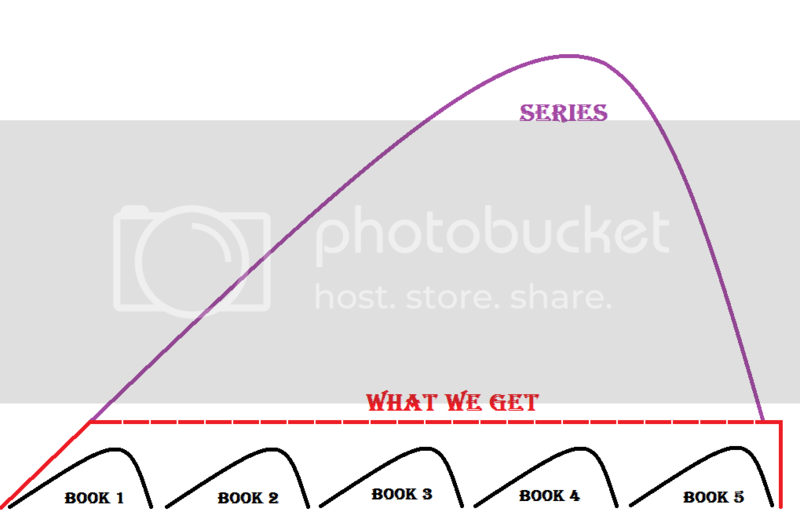 Book 4 was a noticeable improvement and instead of this steady flat line there has been this feeling of build up. To what we don't know yet, but if she can keep it up without falling back into what was happening in the first books then we could be in for a good series end. As regrettable as Twilight is(mainly for the type of standards set), the series manages to keep sight of the fact(either on accident or no purpose). While the final book has its own BCR the whole final half of the book is a resolution. People who like "romance"(I quote because I know some romance readers would kill me for calling it a romance) have the whole end of the book(in spite of the conflict that is still occurring) to soak in their happily ever after. I feel safe in saying this because you'll notice that they were not calling for Meyer's head on a pike. You laugh, but I've seen animal less rabid over food than some of the fans over this series. I know a guy that went to buy the last book left of the series final for his daughter and lost an arm(ok I don't actually, but I'm sure it almost happened). 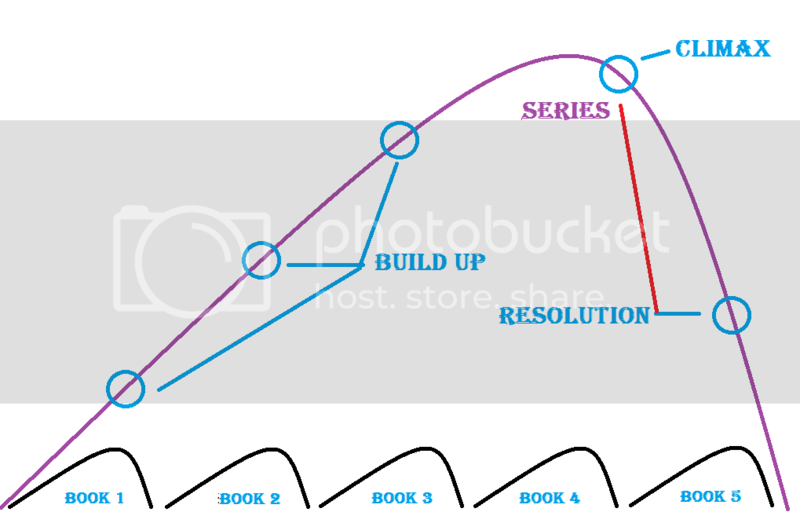 Build up, Climax, Resolution are important elements to a story and this becomes no less when dealing with a series as a whole. 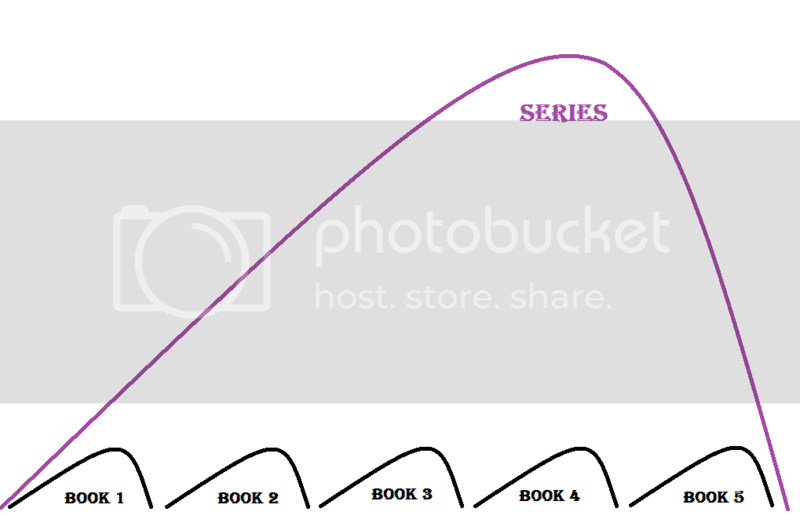 It becomes even more imperative if you are going to keep readers for the life of your series. You can't ignore this very basic aspect of storytelling. At some point you need to move past/resolve a subplot so that you can give way to new ones and not just the same ones reused.